Cherry Blossoms Paint A Lake Purple Making Tokyo Look Like A Fairytale | Tokyo-based photographer Danilo Dungo uses drones to take stunning pictures of Japanese cherry blossoms. 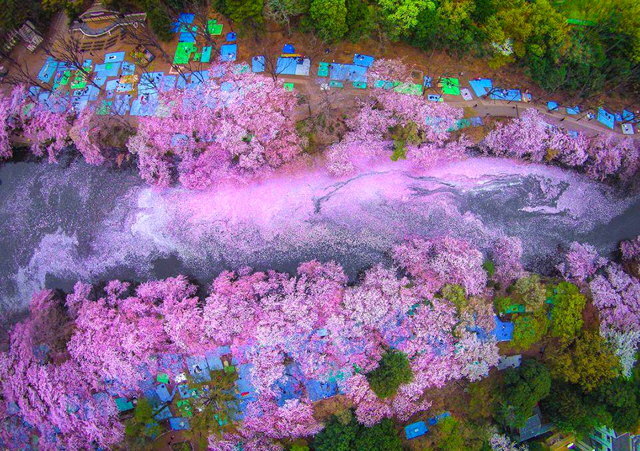 Every spring, he goes to the Inokashira Park to admire the blossoms, and while regular photography capture the park’s beauty, the drones reveal something else altogether. Bet the air up there smells really fresh and clean,cherry-blossom scent. Thanks Gerard,you do find everything in Japan from the silly to the sublime, it's all wonderful.